For Palisades District Superintendent Rev. Gina Kim, every day is her favorite day. From the tagline at the end of her emails that read: ‘Today is my favorite day’ to the jovial, overflowing elation radiating from her presence, Kim is a living expression of gratitude and calling. Having started her appointment as Palisades District Superintendent in July, Kim now works with more than 60 churches in the district. With 24 years of full-time ministry, Kim transferred to GNJ from East Ohio in 2006 and has grown ministries in each place she served. Bishop John Schol has described Kim as a “Spirit-led pioneer” who “initiates a vision of what could be” developing strategies and inspiring people to work together to achieve world-changing mission. But ministry wasn’t always a part of Kim’s life. 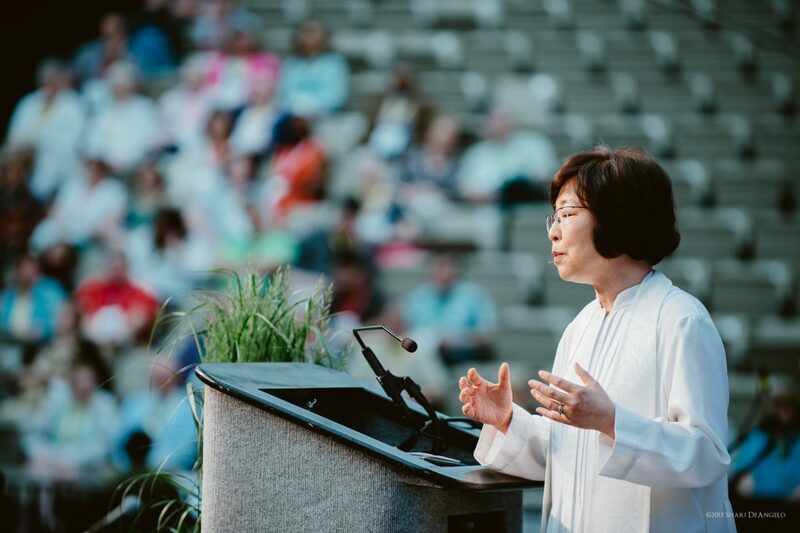 Before she became known for celebrating every day, Kim arrived in the U.S. from Korea as a realist, disregarding and writing off all matters of faith. While studying at the University of Idaho, a professor of computer engineering demonstrated the love of Christ to Kim by sharing his faith, patiently and subtly. For years Kim was rooted in the Korean Community Church in Englewood where she served as a youth pastor before moving to Ohio with her husband, Chong. There, working as a computer engineering project leader, Kim felt compelled to share her faith with coworkers. Lunch hour became a prayer and study group session. “It was my passion,” she exclaimed! “I wanted to share the gospel with everyone.” Kim felt led to leave her job and enter a period of prayer and solitude to seek direction. She expected to hear from God clearly. “And I did,” she said. “I heard God tell me one night to feed His sheep.” But Kim was concerned. “I remember saying to God, ‘who am I? I’m just a computer engineer.’” Kim didn’t know how she would teach or lead, but she was confident that God would train her. She accepted her calling and immediately doors started opening. While earning her Masters of Divinity at Ashland Theological Seminary in Ashland, Ohio, United Methodist recruiters from the East Ohio Conference arrived on campus and interviewed Kim. “At the time, I didn’t really know anything about the United Methodist Church, but the recruiters were impressed with me and connected me with the district committee,” Kim said. After passing the interviews, she was sent to the Board of Ordained Ministry and served her first appointment at Twin Falls UMC in Munroe Falls, Ohio. From there she went on to serve two cross-cultural church appointments in East Ohio. In 2006, Kim and her husband returned to New Jersey and to their beloved Korean Community Church. For five years Kim served as the church’s Associate Pastor, working alongside people she considered family and had counseled and mentored under before moving to Ohio. “I loved every minute of working there because I had such a special affection for that church,” she said. Always willing to step outside her comfort zone, Kim followed her calling to Wesley UMC in South Plainfield and became the full-time senior pastor, serving a vital, multicultural congregation and facilitating its spiritual growth. Under Kim’s leadership, Wesley UMC grew significantly with increases in worship attendance, professions of faith, disciples in small groups, and mission engagement while the congregation faithfully paid 100 percent of its shared ministries. “Rev. Kim is a Christ-centered, Spirit-filled believer who exemplifies many of the characteristics we look for in clergy,” said Bishop Schol after introducing Kim to the GNJ Bishop’s Clergy Convocation in January. For the congregations in the Palisades District, Kim hopes for spiritual growth and fruit-bearing ministry. She encourages leaders to pray and study the Bible to “go deeper and wider” to become a significant influence on society. Her hopes include seeing the emergence of new faith communities, developing more mission work, and unity among the district churches in cooperation to work together to impact their community for Christ. Kim’s relational qualities stood out to Bishop Schol, who saw her as “genuine in her relationship with God and others” who “seeks a team experience and connects with others through their interests and ideas.” A people person by nature, Kim enjoys gathering with friends over good food. She says her favorite part of serving as district superintendent so far has been meeting people and visiting churches to explore the variety of worship styles.